Don Meichenbaum, Ph.D. is Distinguished Professor Emeritus from the University of Waterloo. Ontario from which he took early retirement 20 years ago. He is presently Research Director of the Melissa Institute for Violence Prevention in Miami (Please see www.melissainstitute.org). 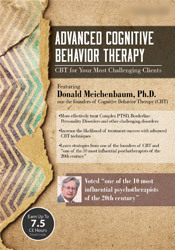 He is one of the founders of Cognitive Behavior Therapy. In a survey of clinicians reported in the American Psychologist, he was voted "one of the ten most influential psychotherapists of the 20th century." He has received a Lifetime Achievement Award from the Clinical Division of the American Psychological Association and he was Honorary President of the Canadian Psychological Association. He has presented in all 50 U.S. states and internationally. He has published extensively and most recently published Roadmap to Resilience: A Guide for Military Trauma Victims and Their Families (visit www.roadmaptoresilience. org). His other books include Treatment of Individuals with Anger Control Problems and Aggressive Behavior; Stress Inoculation Training; Facilitating Treatment Adherence; and The Unconscious Reconsidered. He has consulted for various populations including veterans’ hospitals, the National Guard, psychiatric treatment centers for children, adolescents and adults, treatment center for individuals with traumatic brain injuries, torture victims, Native populations, deaf populations and school boards. See papers by Dr. Meichenbaum on www.melissainstitute.org (go to home page and click on Author’s Index and scroll to Meichenbaum). Financial: Donald Meichenbaum is Research Director of the Melissa Institute for Violence Prevention and Treatment. He is the Distinguished Professor Emeritus for the University of Waterloo, Ontario, Canada. Dr. Meichenbaum receives a speaking honorarium from PESI, Inc. Non-financial: Donald Meichenbaum has no relevant non-financial relationship to disclose.